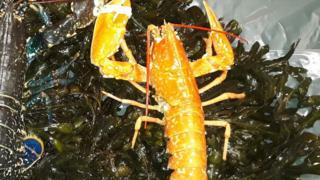 An extremely rare orange lobster caught off Northern Ireland's north coast has gone on display at its new home. Caught by fishermen off Rathlin Island, the extraordinary crustacean has been rehomed at the Exploris Aquarium in Portaferry. The orange colouring occurs once in every 20-30m lobsters. The UK's native lobster is naturally dark blue in colour, and only turns reddish orange when cooked. The discolouration is caused by a lack of specific proteins in the lobster's shell. Exploris has been delighted to welcome its new addition. "Often the fishing fraternity around our coastline will contact us with interesting species, and we are grateful for this as it enables us to inform and showcase multiple species that they would not normally have an opportunity to see," said Peter Williams, the aquarium's senior aquarist. Exploris' one-in-30m addition, however, is not the rarest to find a new home at the County Down aquarium. Exploris' aquarist said the various colour morphs were "an interesting addition to any public aquarium". "This also provides a platform for Exploris talk about the importance of conservation," he added.